Sri Ramana Leela: 44. QUO VADIS? WHERE did that light go? What happened to it? For some devotees Ramana was nothing less than the attributeless Brahman. In the recesses of the lotus-shaped hearts of all, beginning with Vishnu there shines as pure intellect (absolute consciousness) the Paramathman, who is the same as Arunachala Ramana. When the mind melts with love of Him and reaches the inmost recess of the Heart wherein He dwells as the beloved, the subtle eye of pure intellect opens and He reveals Himself as pure consciousness. to know was who among those embodied celestials Ramana was. But Bhagavan's reply amounted to saying: "Leave alone that question. Try to know my nature, Ramana's nature, and be done with it." Likewise, for some devotees Ramana was just a jnani [?]. A jnani [?] is Brahman, nothing else. From a jnani's body the jiva [?] does not go out, it just merges in its source. These people also repeat Ramana's words, "Where can I go? I am here." But there is little scope for interpreting these words as referring to the state after physical death. Further, for one who has attained Brahman there is nothing like here or there. Therefore to interpret that Ramana continued to stay at the Ashram would be absurd. Those who have seen a jnani's last moments say that a jnani's body remains as if in deep sleep with the sense organs being still, the eyes and mouth being closed. But in the case of Bhagavan the mouth was not closed. Could not the prana [?] have gone out through the mouth? Lastly, at the last moment of Bhagavan a brilliant light shot across the skies in the north-eastern direction which was seen by thousands. What was it other than Ramana jyoti? any natural abode. In Bhagavan's case also there was a brilliant light which had its path. Some say that as Bhagavan had no latent tendencies which alone caused birth on the earth he no longer would reappear on the earth. Actually, Bhagavan himself said a number of times that his relationship with his devotees was unbreakable and that he would always be of help to them. Unless Bhagavan was a celestial with a body how would this be feasible? As Kavyakantha said, Bhagavan was an aspect of Skanda and he possibly returned to his natural abode. Skanda also left in the form of a light. In saying so, one is not in anyway minimizing the grandeur of Bhagavan's experience of the Atma. Bhagavan himself said that though Siva and others were jnanis, they had to carry out some activities assuming a form. There are several points in favour of the statement that Bhagavan was an aspect of Skanda. On 21 November 1945, the utsava vigraha of Arunachaleswara went round the hill and when it reached Ramanasramam gate, Bhagavan was sitting on a platform near the water tap close to the book-depot. The plate containing the Deity's prasadam, vibhuti was brought to Bhagavan who took some vibhuti and said with great reverence, "The son is subservient to the Father." of the celestial Skanda and was a part of the line of acharyas like Narada and Sanatkumara who appeared on the earth to impart wisdom to people whenever dharma [?] was on the decline. In this context one may recall a conversation which a devotee had in 1934 with Bhagavan. During the course of the conversation Bhagavan pointed out that the devotee was mistaking him to be only the body and also revealed that he lived "simultaneously in twenty lokas in twenty bodies. The bodies keep coming and going. Who is to keep track of which body is coming or which is going? The important thing is to abide in the Self and not to observe the changes in the bodies." This entire discussion has been necessitated because some described Ramana as having had Brahma nirvana or Mahanirvana (the word `nirvana' seems to be owing to Buddhist influence). Some other devotees say that Ramana continues to be Skanda and that he listens to our prayers. This could be so. at other places but this depends almost entirely on the strength of the prayers of devotees. On the other hand, at Arunachala, owing to the favourableness of the kshetra [?] it becomes easier. This is especially true of the spot of Ramanasramam where Ramana spent over two decades. Bhagavan Ramana's sanctitiy was enveloped by the physical body composed of the five elements, that is now buried at Ramanasramam. Even now the vibrations which were experienced during Bhagavan's lifetime can be felt there. A moment's dhyana [?] at Ramana samadhi or in the meditation hall can make one experience Bhagavan's force even now. That current of peace still flows there. It is also the place where the dust of Bhagavan's feet is available and is it not enough if that dust envelops us? So also this is the place where the dust of the feet of Ramana bhaktas is available which again is sacred. 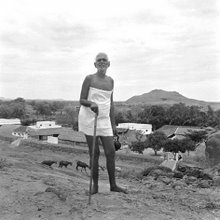 The Ramana teertha owes its origin to Ramana himself. This is the air Bhagavan breathed. This is the sky which reflected in his heart. Like Krishna at Mathura, Bhagavan Ramana is very close here.